Amit :Eeek...I have never ever in my life gone into a railway station toilet in India. LOL and the toilets in railways wyack......the lesser sais the best..
Ugh! so true. So true. Hideous. Even my 4 yr olds are picky about the toilet conditions. Luckily, such experiences in the US are fewer. The toilets are fairly decent except the Gas station toilets. Enough said!! u were dead bored and didnt hav anything to write about so seriously..........................u write about the filthiest thing possible? u must hav been terribly bored! Ha! Hilarious! And I'm all about #4. Gives you an excuse to buy new clothes. LP I agree with toilet training being a part of school education. I am all for paid toilets so that someone can be held accountable for ensuring the flush works and the bin is emptied. I also do the lining the seat with toilet paper, when we travel on the highway, I carry toilet paper in my bag. There is no choice here, if we don't do this we will have to find a place near a railway line or behind some bush. So true! 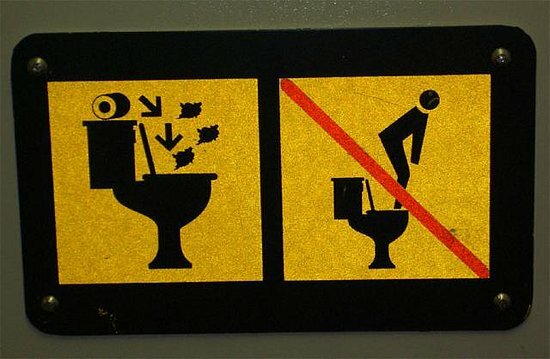 I am always apprehensive about entering a toilet wondering what stuff I will see floating around. And, the odor that some people leave behind even after flushing can really make you want to throw up. Airport toilets are horrible too :(.